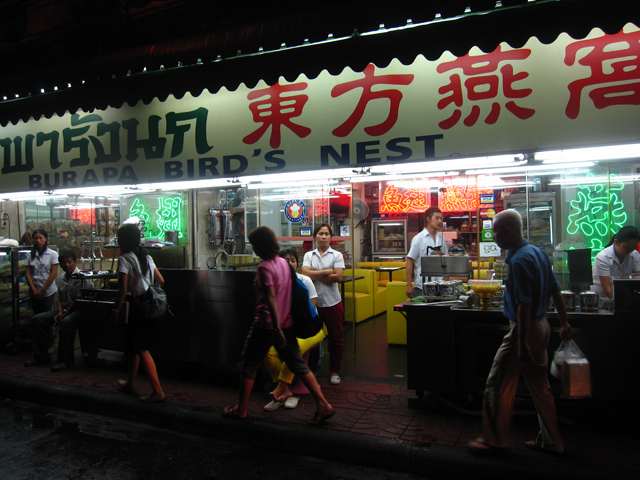 Bangkok's Chinatown, known as Yaowarat, is one of the most thrilling places in town! The area is alive and bustling at all hours of the day with busy markets, thriving businesses and lots of restaurants. Stopping by and spending a little time in Yaowarat is a must when visiting Bangkok. 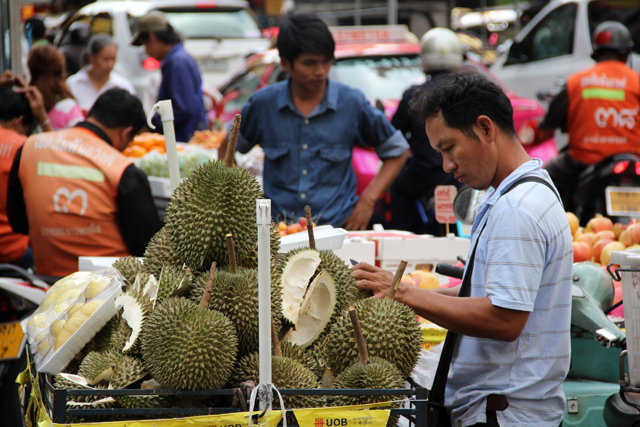 The Chinese came to Bangkok as poor farmer's, searching for a new way to make a living. With a strict attitude to succeed, paired with the Chinese business savvy mindset, many of the Chinese in Bangkok worked their way into starting large scale businesses and eventually Yaowarat became the center of trade in Bangkok. 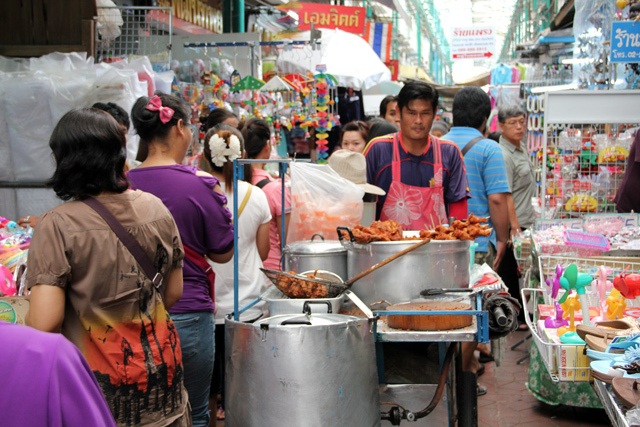 Today, Bangkok's Chinatown is one of the wealthiest areas of town. Yaowarat Road is full of gold and jewelry stores, traditional Chinese medicine shops, and high end food supply distributors. Just like every other Chinatown in the world, you'll know exactly when you're in Yaowarat by the giant signs filled with huge Chinese characters, the flashy neon billboards, the scores of foot traffic, and the smells and sounds that can only come from a Chinatown. Though Yaowarat does have its share of extremely high end Chinese Thai restaurants, the area is also well known for its abundance and quality of Bangkok street food. Everyday at around 5 pm street vendors begin setting up their tables on the side of the road and preparing for another busy night of hungry customers. From specialty Kuay Jab (rolled rice noodles) to the freshest seafood, Yaowarat is guaranteed to be stomach pleasing! After eating delicious street food, in my opinion there's not a lot that's more fun than sampling exotic dishes. Though it can be slightly pricey, Yaowarat is the place to go if you are looking to try things like bird's nest soup, shark fin soup, durian (available year round – not just during the season), or even devour an entire roasted suckling pig! Though all of Bangkok is well known for its crazy amount of street shopping, the area around Yaowarat takes things to the next level. 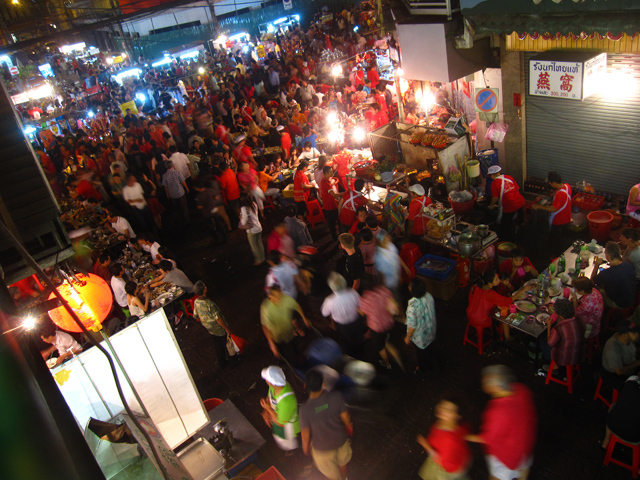 The Sampeng Market in particular (a small lane that parallels Yaowarat Road) is a humongous open air street market that stretches through the alley for a few kilometers. The market is stuffed with every form of trinket imaginable – just be careful of hot flaming snacks coming through the aisle! On Chinese New Years the streets around Chinatown are blocked from motorized traffic and the road becomes a walking street filled with hundreds of vendors and thousands of pedestrians. Though at times it can be overly hectic, there's nothing like being part of a massive crowd out to have a good time and to snack on all kinds of delicious things! Another popular event in Yaowarat is Thailand's annual vegetarian festival. Since the tradition was started by the Chinese, the center of the festival takes place in the heart of Yaowarat. 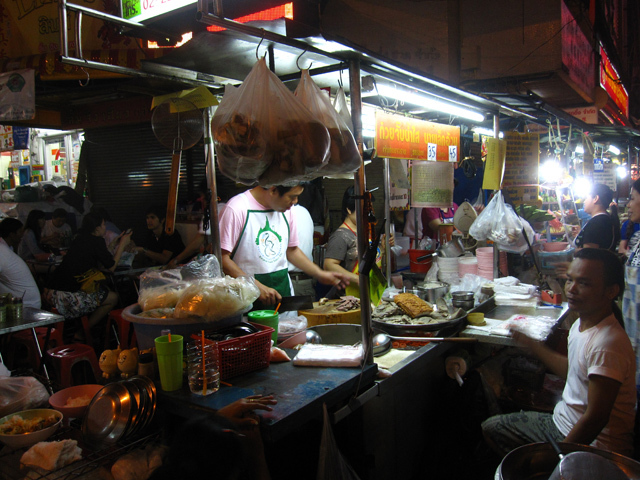 Every year hundreds of stalls set up serving top of the line vegetarian Thai food. With so much to do and see (and eat), Yaowarat is one of the most thrilling parts of Bangkok to visit! Of all the places I’ve been in Thailand, I least liked Bangkok the most. But what I liked most about it was Chinatown. Its ri-dic-u-lous. I actually found it by accident wandering around the train station after realizing our train was hours away – which is perfect to do if you got time to kill before your train as its a walk away. But yes, its hectic, dense and alive.